Voyager Model decided to follow the idea introduced a few years ago by the Eduard company and started to release mini-versions of their big PE Update sets. 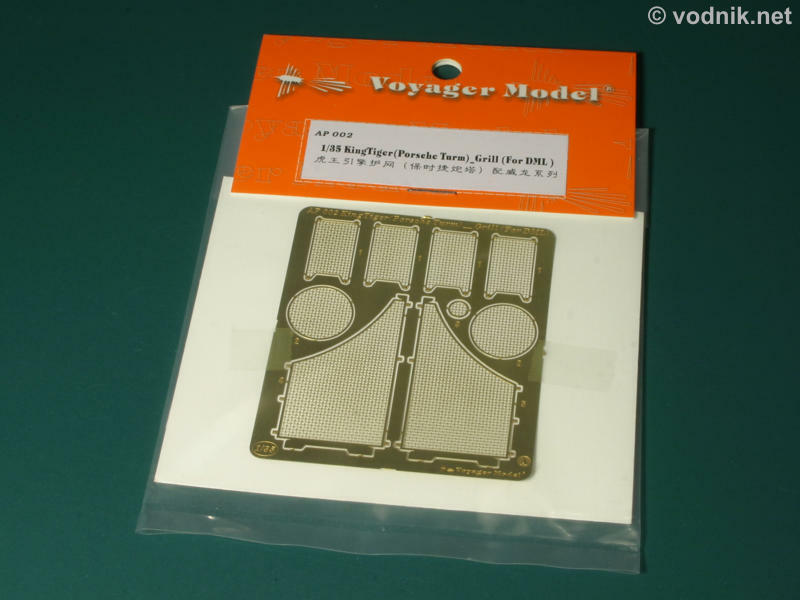 Those small sets from Voyager contain only various engine grilles - probably a wise choice as these parts are usually omitted or highly simplified in plastic kits and adding PE replacements greatly improves the look of the model even if no other aftermarket parts are used. Grille sets are also much easier to use and of course are much cheaper than full PE sets, so are attractive proposition for beginning modelers. 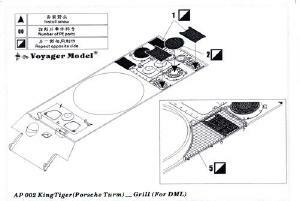 For modelers building Dragon model of Porsche turreted King Tiger, but not willing to purchase full PE set PE35025 (reviewed here), Voyager released a new set in "AP" series. This small set contains just one photoetched brass fret (64 mm x 74 mm) in a plastic bag. 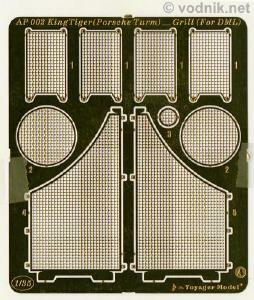 Small instruction sheet - not much bigger than the brass fret - is included with two pictures showing how the grille parts should be attached to the model. There are nine grille parts included in the set and seven of them only need to be cut of the fret and glued to the model. Two largest parts require some bending to give them correct shape and this may be the most difficult assembly step, as long rounded bends have to be made - I suggest using metal or plastic rod as a template and roll the brass part on it. 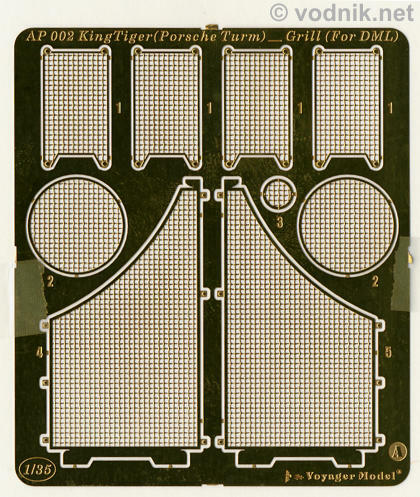 Grille parts are identical as those included in PE35025 set, now grouped on one fret. I already wrote it in full set review and will repeat it here: the meshes in those grilles are the best I have ever seen made as photoetched part. They look highly realistic. I'm not certain whether they are accurate (actually I believe that distance between wires in the mesh is a bit too large - the mesh is not dense enough), but they will sure look the part. Click on picture to enlarge it. Photoetched brass fret. 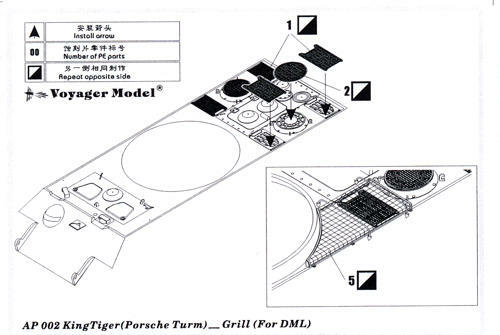 New grille mini-sets from Voyager seem to be a very attractive products and the King Tiger set reviewed here is a good example. I'm sure Voyager will soon follow this release with a set for Henschel turreted King Tigers, since they already offer a full set for that Dragon kit (PE35036 reviewed here). Modelers with tighter budget and those who feel they lack skills to use very complex large PE sets can now improve their models with less effort and at much lower cost. Recommended!